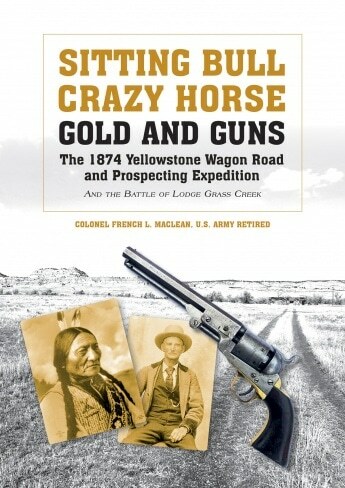 (August 27, 2016) Schiffer Publishing has received Sitting Bull, Crazy Horse, Gold and Guns: The 1874 Yellowstone Wagon Road and Prospecting Expedition and the Battle of Lodge Grass Creek. The book is available now ! This is the story of 150 of the most adventurous scouts, gold prospectors, gunslingers, buffalo hunters, and Civil War veterans of both sides—they may have been the deadliest collection of shooters to ever hit the trail. This is the most detailed work ever produced on the obscure legend of the 1874 Yellowstone Wagon Road Prospecting Expedition in the Montana Territory—the product of multi-year research across the country, and visits to the three significant battlefields and expedition route of over 500 miles—an event that impacted the Little Bighorn in 1876. Numerous legends of the West rode on the expedition, later playing key roles in the Great Sioux War of 1876. Their adversaries now were the Lakota and Northern Cheyenne—some of the greatest light cavalry to ever gallop over the North American continent. And watching their every move were Sitting Bull, Gall, Hump, Crazy Horse, and a renegade chief named Inkpaduta, ready to strike. The book also lists warriors involved in these fights and provides detailed information on several renowned scouts during that era such as George Herendeen, William T. “Uncle Billy” Hamilton, Jack Bean, “Muggins” Taylor, Addison M. Quivey, Zadok “Zodiac” Daniels and Oliver “Big Spit” Hanna. It also describes exploits of heroes you have never met. John Anderson, a former slave, who had fought in an all black unit in Kansas in the Civil War, was on the trek. At the Battle of Great Medicine Dance Creek, both the frontiersmen and the warriors stopped in their tracks to watch an epic fight to the death, with knife and tomahawk, between Anderson and a Lakota chief! John’s photo is in the book, as is perhaps the only photo in existence of scout “Muggins” Taylor, who two years later rode from the Little Bighorn battlefield to the Fort Ellis telegraph office with a note from General Alfred Terry on the debacle that became known as Custer’s Last Stand. Fortunately for Taylor, much of that route had been the same as he had scouted with the wagon train in 1874. As a special feature, the book presents information that may link John “Liver-Eating” Johnston with the wagon train. And using new genealogy resources, such as Ancestry.com, the book traces the lives of many of the participants on the wagon train, whether they later again got the itch to search for gold, ended their days at Deadwood in the Dakota Territory, or whether they practiced medicine outside of Tombstone in the Arizona Territory during the “Gunfight at the OK Corral” era. The epilogue of the book documents the re-creation of Jack Bean’s nearly one-mile shot against a single Lakota warrior that we attempted, during the preparation of the book, to duplicate at the exact location it occurred. The work is also a history of the wild territory of Montana, including the Montana Vigilantes, no nonsense territorial governors such as Sidney Edgerton and Benjamin F. Potts, the wild town of Coulson, and the search for the mythical Lost Cabin Gold Mine. Much like today, it has an element of the political elites taking advantage of hard-working regular folks, who ultimately had the last laugh and lived the way they desired. Perhaps most importantly, the book sets the stage for the Great Sioux War of 1876, which became the cataclysmic event in the nation’s expansion to the west. Many of the significant incidents on the expedition happened within 30 miles of the Little Bighorn, so for those visitors to that battlefield, this book shows you numerous additional locations to visit during your trip, including GPS information to make navigation easy. In fact, if you visit Fort Phil Kearny, near present-day Buffalo, Wyoming and adjacent to the Fetterman Fight, follow with an examination of the 1874 Yellowstone Wagon Road and Prospecting Expedition—as shown in this book—and visit the Little Bighorn Battlefield, a total stretch of 93 miles, you can put the entire Lakota and Northern Cheyenne fight with the United States Army during the gold-rush on the Plains into perspective. Did I mention the Boothill Cemetery?